Overview: Unbeknownst to most of the people of Earth, alien races have been keeping an eye on our home planet. One of those races, the Kree, has parked a spaceship in orbit to do a further observation of the Earthlings. Captain Mar-Vell is sent to the surface for further investigation, finding himself near a military base in Florida. Mar-Vell’s commander, Col. Yon-Rogg, despises his assignment and wants nothing more than to blast our planet to bits and return to the Kree home world. Finding himself at odds with his commander, Mar-Vell breaks ranks with the Kree and vows to protect the Earth as Captain Marvel! Captain Marvel finds that the Kree are not happy with his decision, as he is forced to face off against Yon-Rogg and Ronan the Accuser. And given that the Kree are the mortal enemies of the Skrulls, of course, the Super-Skrull has to cross paths with Captain Marvel. One of the supporting characters created for this series was Carol Danvers, a security officer at the military base during the origin issues of our hero. However, in issue #18 (November 1969), Carol is caught up in an explosion with Captain Marvel. After she has fully recovered, she later finds out that her DNA has been fused with Kree DNA, and it has given her many of the same powers as Captain Marvel. Carol’s story will continue in the pages of her own comic, which have been reviewed in Essential Ms. Marvel Vol. 1. What makes this Essential? : OK, full disclosure and SPOILER warning time. I never really got into the Captain Marvel character. Want to know why? Because the first time I ever saw the character was in Marvel Graphic Novel #1: The Death of Captain Marvel. He was killed off the first time I read him! And it was a shocking move by Marvel, having a heroic character die not in battle but in a bed from cancer. So given the dramatic finale to his career, I had not desire to go back and read his adventures. In all fairness, the early 1980s still was part of the era where characters that were deceased stayed deceased. Of course, Marvel would reuse the name Captain Marvel (to protect the trademark) with later characters. But in today’s era, sometimes the best characters to use are the dead ones, and a good writer finds a way to resurrect the dead. So I read this volume only knowing the character’s end. This is a mixed introduction to Captain Marvel. I fully believe this is a book that got much better as the story progressed, so I am looking forward to reading Essential Captain Marvel Vol. 2 sometime soon. (You can read into that if the book got better as the story progressed, then the early issues must have been a rough ride to get through.) The Gil Kane issues in the end of the book were my favorites, as the artist finds a way to make Captain Marvel feel more alive. (I’m still a big fan of Gene Colan, but these issues just didn’t do it for me. Thankfully I have plenty of Colan Daredevil and Dracula issues to enjoy!) Bottom line – I think this is worth reading, but I don’t know that this is worth owning. Footnotes: Captain Marvel #20 and #21 are also reprinted in Essential Hulk Vol. 3. Read my review of Showcase Presents SHAZAM! Vol. 1 to learn about the name battle between Captain Marvel and Captain Marvel. If you like this volume, try: the Captain Marvel series from 2000 by Peter David and ChrisCross. This is a new Captain Marvel, Genis-Vell, who is the gentically-engineered son of the late Mar-Vell. 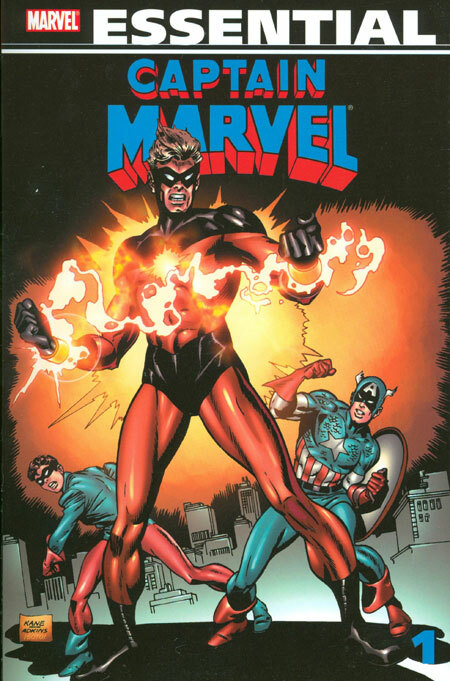 Introduced in a 1996 Captain Marvel mini-series, the character went by the code name of Legacy. He rose in popularity when he was included in Avengers Forever maxi-series, as a future Avenger plucked from time to fight in the Destiny War. At the climax of that story, Captain Marvel finds that he must use the Nega-Band connection to save Rick Jones. Following that series, Genis-Vell moved into his own monthly book, still bonded to his father’s former side-kick. 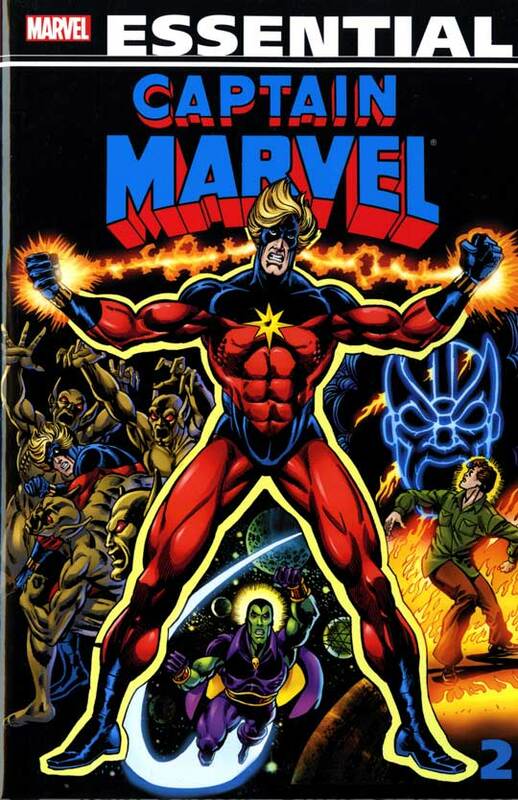 The series ran for 35 issues, before being rebooted in a Marvel promotion in 2002. The reboot, still written by Peter David, ran for another 25 issues. David is one of the best comic book writers, so any of these issues are a treat. Sadly, this is not a series that has been reprinted beyond one trade paperback, so you may need to dive into some back-issue bins to track this one down.